It's exciting to see small British craftsman companies gradually establishing themselves. Inevitably some will fail, but Liberty - already in its fourth year - is surely a stayer. The art of drum construction revolves around shell building and we were greatly impressed by the quality of the MPX shells and the obvious care that is taken. Well built, great sounding drums. Because the shells are so thin you get a darker tone than you might otherwise expect. The birch snare is well-behaved, sharp and versatile. We'd prefer the sharp edges to be rounded off slightly. Based in County Durham, drum builder Andrew Street registered Liberty Drums as a limited company in 2006. The MPX is Liberty's latest, high-end, American maple shell pack drum kit, featuring fashionably shallow 'fast' toms. The MP (maple) X (extremely thin) kit is a five-shell pack with 10"x6" and 12"x6" shallow toms, together with 14"x12" and 16"x14" floor toms and a 22"x18" bass drum. The bass drum is undrilled and the small toms have lightweight aluminium Gauger RIMS mounts. "It's obvious that great care has been lavished on these shells and they are blemish free, the timber of high quality"
The most striking thing about this set is the thin North American maple shells. The toms are six ply and 3.9mm thick while the bass drum is eight ply and 5.3mm thick. This, Andrew says, is the thinnest Liberty can make whilst guaranteeing the shells won't distort: "Just the right thickness for outstanding resonance but enough integrity to be strong." Bearing edges are a sharp 45 degrees and are cut and finished superbly. It's obvious great care has been lavished on these shells and they are blemish-free, the timber of high quality. Andrew currently uses his own design wooden moulds, but has begun converting to hydraulic, alloy moulds. The bass drum hoops are also maple ply, finished in contrasting natural lacquer, and have sharp edges, which we found a bit surprising. Surprising because everything else has been done with such thought and we'd prefer these to be rounded off slightly. The outside is satin mahogany (Mann's Brown Mahogany stain), one of six standard finishes. Unusually these days, the inside is finished in exactly the same way - another indication of Liberty's assiduousness. If you really want a different finish, Liberty can also do stain fades, or solid or stain high glosses. The MPX certainly has a distinctive look. The lugs are off-set top and bottom, forming a diagonal pattern around the shells. This is actually necessitated on the small toms by the shallow 6" shell depths - the generic, rounded lugs themselves being quite bulky. But, for consistency, the pattern is carried through on the large toms and bass drum also. Like most small new companies, Liberty relies on generic metalwork. This is no big deal except that you don't get the exclusivity of the big manufacturers. The bass drum spurs, tom tom legs and snare throw-off are all familiar, reliable designs. The toms have 2.3mm gauge steel hoops as standard, but Liberty can do a coloured powder coating if you so desire. Each drum is finished off with a rather tasty, etched Liberty badge. 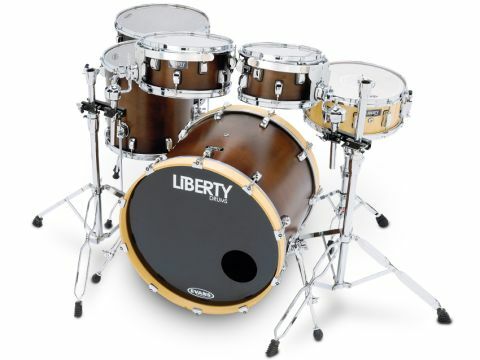 The 14"x6" review snare drum was included as another example of what Liberty can offer. It's a contrasting design in Finnish birch ply with natural gloss satin lacquer. The shell is rather thicker at 7.5mm (15-ply, each ply 0.5mm thick) and Liberty also offers to make snare shells via stave or single-ply steam bent construction, in 13" or 14" diameters and a choice of depths. This drum has 10 double-ended bridge lugs and die-cast rims rather than the standard triple-flanged. Thinner shells mean darker timbre and increased resonance. This is certainly true of the MPX drums, none more so than the bass drum which you can feel pulsating away. And we mean that in a good way, the sensation when you hit it is so open and lively, the total opposite of dreary and dull. The two small toms have the shallow 6" shells which result in an edgy attack with a fairly short sustain. The 12" especially is rather like a snare minus the snares, while the 10" is more rounded. Together they could almost be a pair of timbales. It makes an interesting change from the usual kit, and you probably won't miss the depth since the two floor toms provide plenty of bottom end. The tuning range is in any case impressive - high or low, whichever takes your fancy, all these drums deliver. The birch snare came fitted with a slightly unusual Evans EC Reverse dot batter which combined with the die-cast hoops and the thicker birch shell to make for a bright yet compact sound. The drum doesn't ring so much as some other drums when you play rim shots. There's quite enough resonance without it getting out of hand. Vertically-set inner and outer plies are said to transmit sound more quickly, giving you a faster snare response. There's a pleasing response over the entire head - you get a thick, full backbeat, plus the sensitivity's such that you don't lose the snarey-ness when you play softly or use ghost strokes near the edge. Overall this is an impressive all-round drum which should work for most styles.